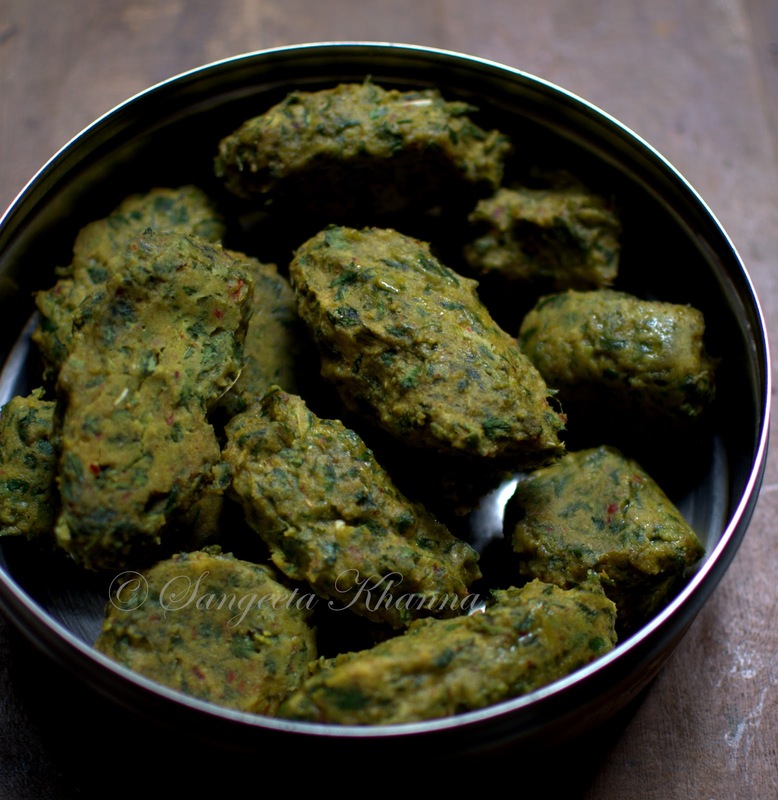 Yes, my grandmother used to call it chane ke saag ka girmachh as it is similar in the cooking technique to the arbi ke patte ka girmachh or patra, long cylindrical dumplings steamed and then cut into slices to shallow fry as a snack. 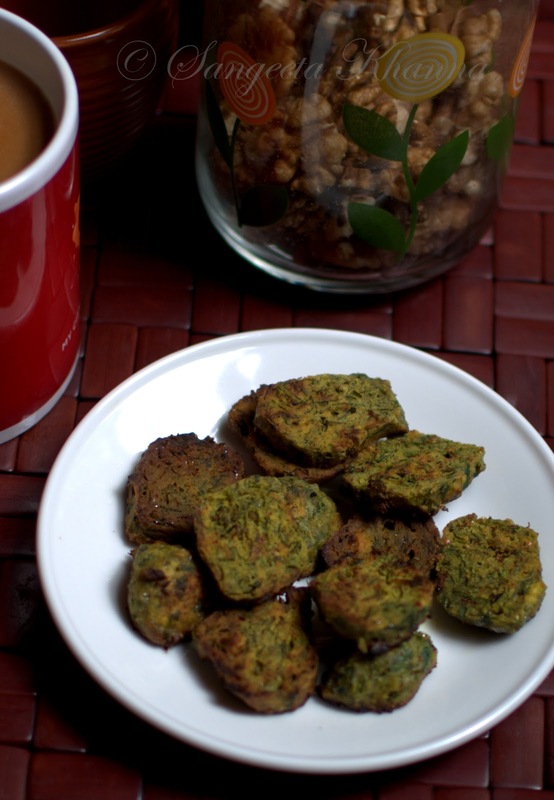 Technically it is more similar to a gujrati muthia or any greens and lentil dumpling that we steam for snacking. I always wonder how versatile and yummy these dumplings are. I have posted another version of steamed dumplings that are tempered with sesame seeds etc for tea time snacking. These can be made with any green leafy vegetables but since I have had these in my childhood, made by my grandmother who was so find of spicy food, I love recreating this in my kitchen whenever there is a chance. The chance comes only when I get Chane ka saag in the market, that is a rare happening here in Delhi vegetables markets. In high end mega malls we don't get to see such desi seasonal greens while Celery and Parsley is abundantly available. I feel sad. We should all keep writing in the suggestion books of those high end stores to stock Indian greens as well, till they realise there is market for the abundantly growing greens in out rural fields. Anyways, we get these at out local vegetable vendors or the farmers markets around the city. Cleaning this greens is a little time consuming but it's all worth it. Just discard the tough stems and keep the leaves and growing buds. Rinse them in several changes of water, drain and then chop finely. It's difficult to chop these finely as the leaves and twigs are quite small, just make a tight bundle, place on the chopping board and keep slicing away. It's a breeze after this. Mix everything together and make a dough adding minimal water. Divide the dough into tennis ball size portions and shape cylindrical dumplings. Grease a plate (microwave safe) and arrange all the dumplings over it. See this post to get a pictorial elaboration of the process, only the shape of the dumplings is different in this case. Cover the plate with a dome cover or an inverted bowl (suitably sized) and steam the dumplings till firm. You can use the idli steamer meant of microwave or for stove top for steaming these dumplings. They cook quickly. These dumplings taste really good while still hot and soft. You can have them as it is, but you need to cool them down before slicing and shallow frying. Cool and place them all in a dabba or container to refrigerate. These keep well for a week and you can slice and shallow fry a small batch for evening tea every day. To shallow fry, heat a tawa or flat griddle or frying pan with a tbsp of oil and arrange all the sliced discs on it. Let them brown on low flame on one side, then flip and brown it on the other side too. They become crisp on the surface and crumbly inside. And yes, you don't even need a chutney with these. Spicy and perfectly crisp with a pleasant taste of chane ka saag. Tastes great with methi ka saag (fenugreek greens) as well. These can also be curried like kofta curry or to make kadhi, but it has been a long time I curried these dumplings. 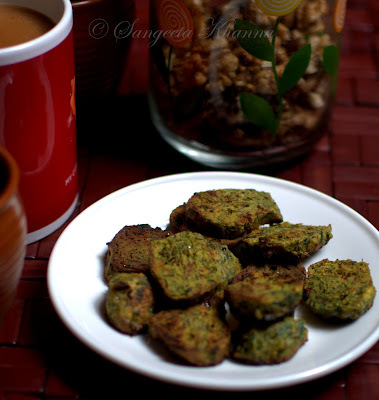 These are so tasty as tea time snack either steamed or shallow fried that we never get enough leftover to make a curry with it. I always say our traditional recipes are healthy and make use of whole foods. Don't you agree? Aah.. I am totally in love with these Sangeeta...it's really a shame that we do not get variety of greens here. Such a wonderful recipe. 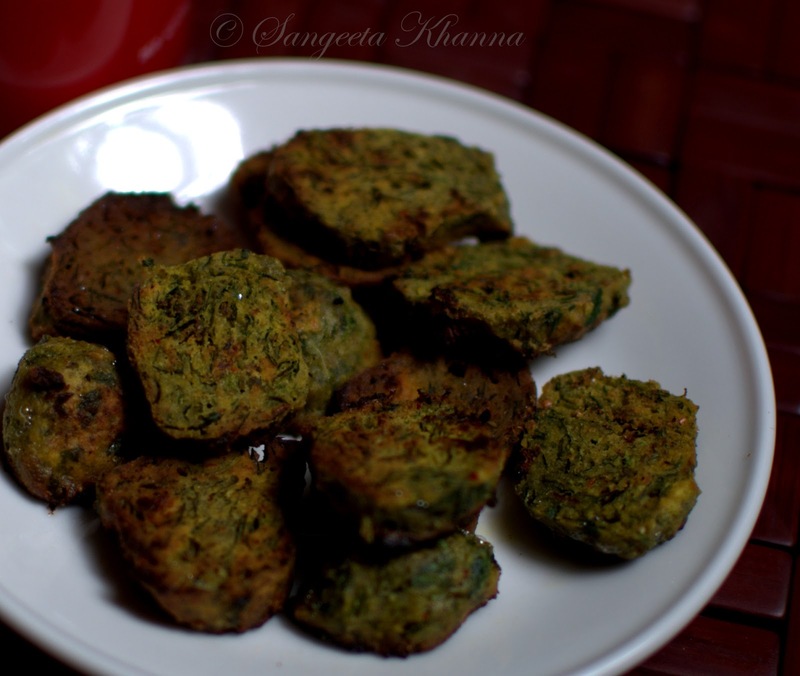 They look so tasty and inviting.. can we use any other greens if we can't find chane ka saag..
Ok, so I made these yesterday and they were delicious. Actually I ate some hot of the steamer with ghee as a snack yesterday afternoon, and then this morning I fried some in mustard oil for breakfast. Both versions were delicious and I will definitely make again. Thank you Jenny. I am so glad it turned out well for you and you liked the taste as well.